BTW, the Mitsubishi didn’t need new glowplugs after all. Joe grubbed around under the bonnet and found a loose wire. It started first time. It’s a ghost vehicle and we only use it for quick forays along our track to either get water or collect fallen stones. 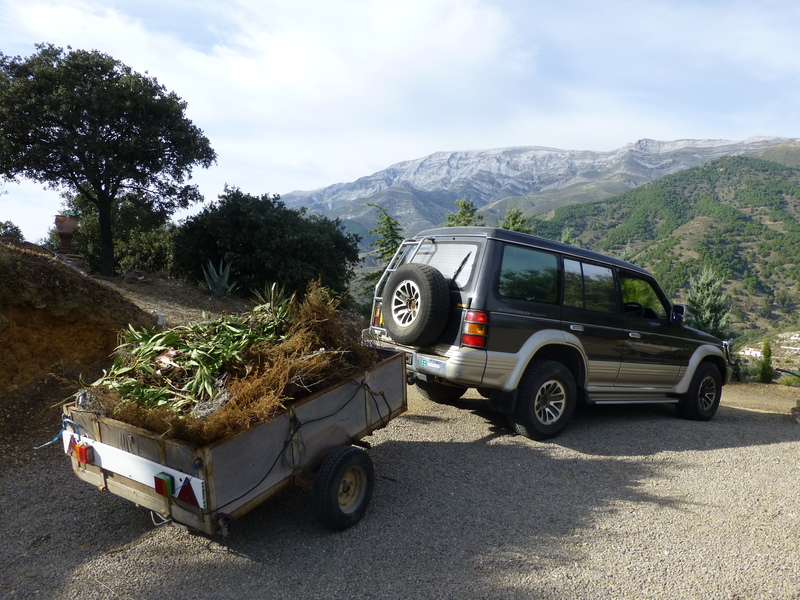 It’s brilliant to have it there as a backup and to pull the trailer to move cut down undergrowth. Anyway, after making a few enquiries it seemed we could probably get away with an out of date ITV so long as we weren’t caught. Also, they aren’t in the habit of asking questions when you eventually turn up. Even the thought of a hefty fine didn’t make me feel I wanted to rush back so I opted for the sanguine approach: che sera! 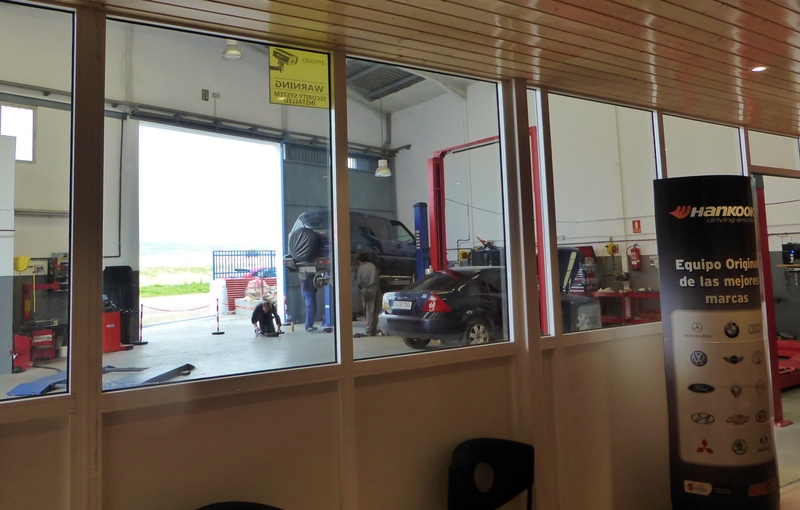 However, once back here in Spain, I could put it off no longer and made an appointment for the next day at a garage in Velez Malaga, some 30 km away. It was raining when we set out, with foggy low cloud. Avoiding the ‘main’ road (very bendy), we went the scenic route (extremely bendy) and doing about 30 mph on a left-hander, the Terrano suddenly slithered into some sort of strange balletic dance. People often say that at times of crisis things seem to go into slow motion and Joe’s wrestling with the out of control vehicle certainly seemed to last an age. We resumed our journey even slower than before, and as I eyed the flimsy crash barrier and the sheer drop below it was a sobering thought that had I been at the wheel then the outcome would have been quite different. I had a good feeling about John, the owner of the well-equipped and run garage, endorsed by a chance meeting one of his regular customers, a car hire operator. John could tell that, in addition to having very little tread, the tyres had been on the vehicle for at least 10 years. 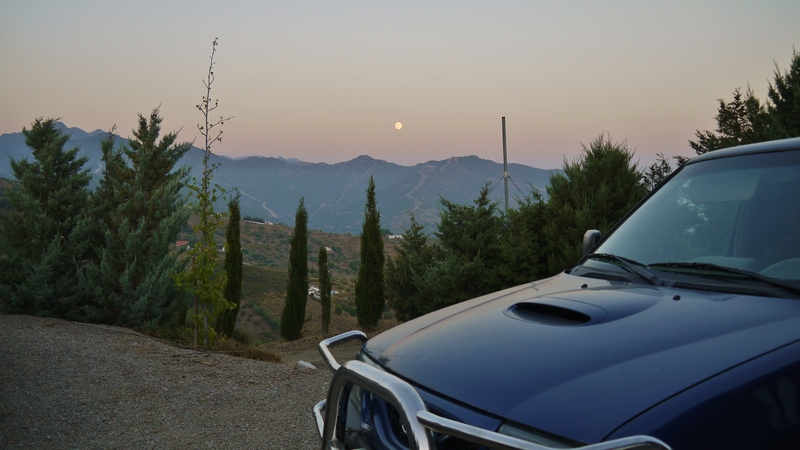 In this part of Spain, he said, tyres ‘crystallise’ (I thought the word was vulcanise), they become hard and dangerous and need to be changed preferably every two years, maximum 3. It didn’t help that the roads were also very greasy. We asked him to do a service, carry out a pre-ITV inspection and fit new tyres and windscreen wipers. We had three or four hours to kill, difficult on an industrial estate. We headed for a large shopping centre about a mile away, passing the sad skeletal remains (in the shape of tramlines and tram shelters) of the much-lauded, very expensive and now defunct Tranvia (tram). It began operating in October 2006 but was closed down in May 2012, then packed off in disgrace to be leased in Sydney by the Australian government . 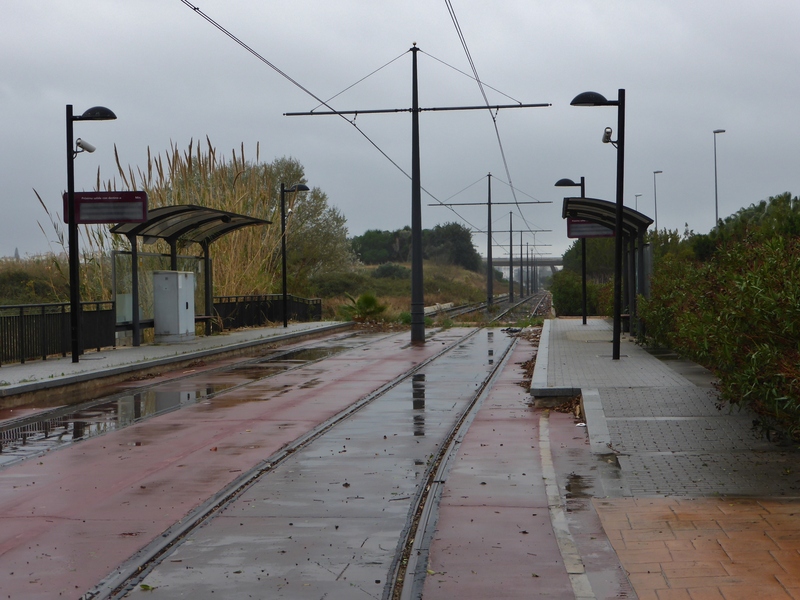 “The first modern tramway in the history of Andalusia … gave on Sunday night his last trip, after more than five years of operation and highly deficit marked by incidents. The closure of the light rail, barely used 1,800 passengers a day, half of those needed to be profitable-certify the failure of a management infrastructure based more on image than on efficiency of service”. It’s amazing how one can spin out a few coffees and sudokus interspersed with a bit of light shopping. The word back at the garage: new brake shoes required plus other bits and pieces. The bad news (besides the cost): the delivery wouldn’t come until 4pm. Off for some more light refreshment in the shape of a nearby caff. Nothing on the menu to tickle our fancy, so we went for our usual standby at such times, salad and patatas fritas. Lingered there for as long as we dare, then with nearly two hours to kill – I know – let’s walk to Lidl and buy something we don’t really need. The Terrano wasn’t really in bad nick, John said, but was showing signs of neglect and he wondered just how long it had been since its last service. The ITV, a necessary evil, was booked for next Thursday afternoon at precisely 2.32!! Assuming it passes first time, the cost will be 40 euro plus their time hanging around – rather them than me. 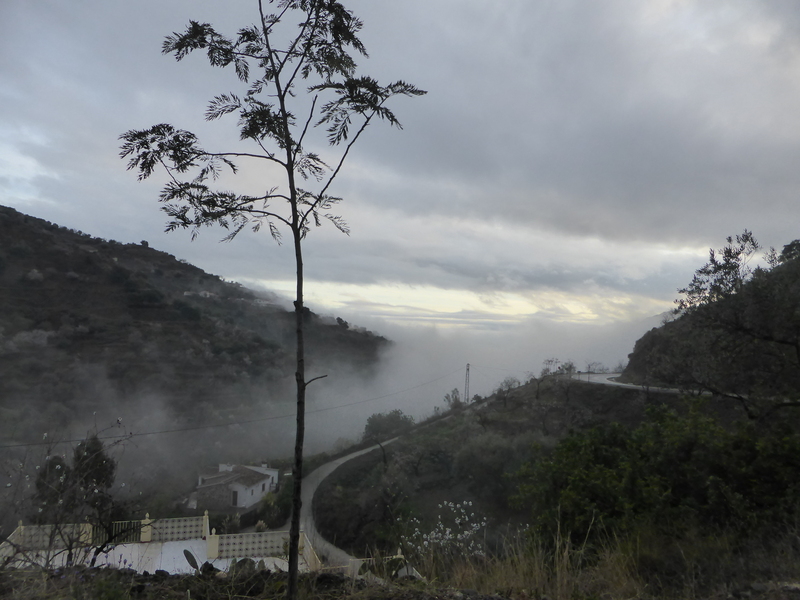 We’d had our fill of waiting, eight hours to be precise, so we were happy to pay our 1,015 euro and get home but not before John recounted a few tales of problems with the powers-that-be over the road to his house; 13 years and it’s still not fixed. To show some solidarity, we sprinkled a few little gems about our run-ins with the Hispanic grey suits as we edged toward the door. See you in a week or so, John. John said it would and on our way home the Terrano handled like a much newer car but we still took it easy on the wet roads as the mist had once again descended and there would be between 100 and 150 bends on the way home. Through Arenas with its ugly new modern walls and equally modern but nevertheless imposing ayuntamiento (town hall), flags flying gaily. 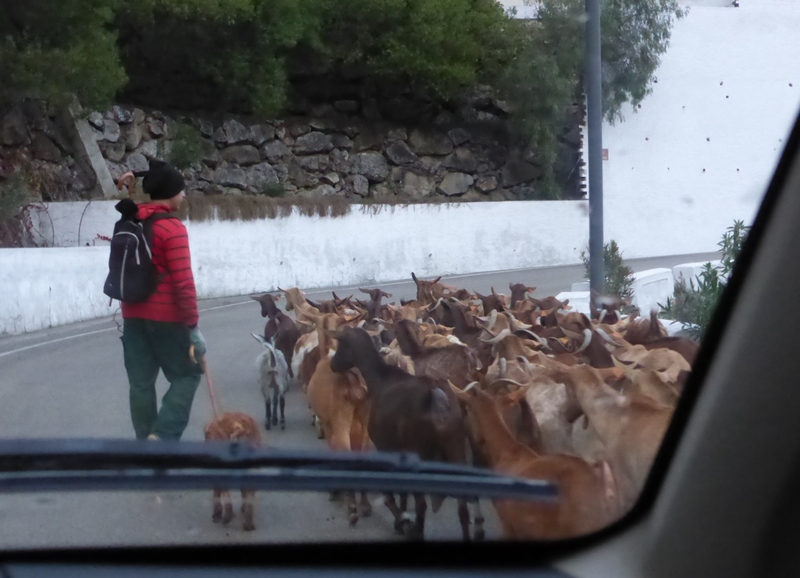 Through the next aldea (white-washed village) called Daimalos, we encountered a posse of goats with their patient young cabrero. As we passed the last village I made a mental note to make a point of actually trying to visit all three villages this year instead of just passing them by. The outskirts are off-putting; why do the Spanish insist on prettying up rough-hewn villages with tasteless modern makeovers and features like turreted fountains? And so we made it back to the house, relieved and a little tired. I wrestled with the metal clasp of the goat gate while Joe opened the main gate. Home safe and sound! Wonder what tomorrow will bring?